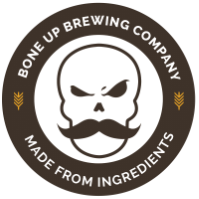 Stats: Estate - Bone Up Brewing Co.
Food Pairing: Clam chowder in a bread bowl. Music Pairing (Jared's Choice): "I Don't Want to Grow Up" by the Descendents. Best Occasion to Drink: Tree fort. Brewers' Notes: Pretty much right as soon as we heard that our friends at Four Star Farms (who grow most of our hops) were sellin' malts, we were in the car headin' their way to grab some grains. And then we realized that we should probably call ahead instead of just showing up in the middle of the night. Anyway, once we sorted out all those pesky "details," we set about brewin' up a beer to celebrate such an auspicious occasion and now it's here! It's a delightful punch o' hops brewed with all Four Star Hops and mostly Four Star grains. Tasty times!